What are Featured Snippets by the way? A featured snippet is a summary of an answer to a user’s query, which is displayed on top of the Google search results page. This information is taken from the relevant webpage and includes the page title and URL. Google has introduced featured snippets back in 2013, and previously they were called “Quick Answers” and only a few of us cited the source, later it became popular with the change in name. Featured snippets work to provide users with a concise, direct answer to the questions on the top of the search results page in the form of text or table without the users having to click through a specific page in the SERPs. But, to get listed in featured snippets the content should be an accurate, unique, and direct answer to the customer’s query. Google, as always look to provide new features which are most relevant, and useful to its customers. This blog is that next big thing which Google has recently introduced to its users to understand whether responses on a given question gets the best answer to their query. Quora is one such platform which works on the basis of the content generation where questions are asked, answered, edited, and organized by its community of users. Google is bringing the same platform onto search by helping users identify which source is most likely to have the related information they were looking for. Breadcrumb is nothing but navigation that indicates the page position in the site hierarchy. Corporate contact displays information related to your company’s contact details in the knowledge graph and it can be a phone number, CEO, Founded, Headquarters, and parent organizations. Carousel displays information for your rich results in the form of slides or list, Carousel is supported for the following content types: Recipe, Film, Course, Products, and Article. 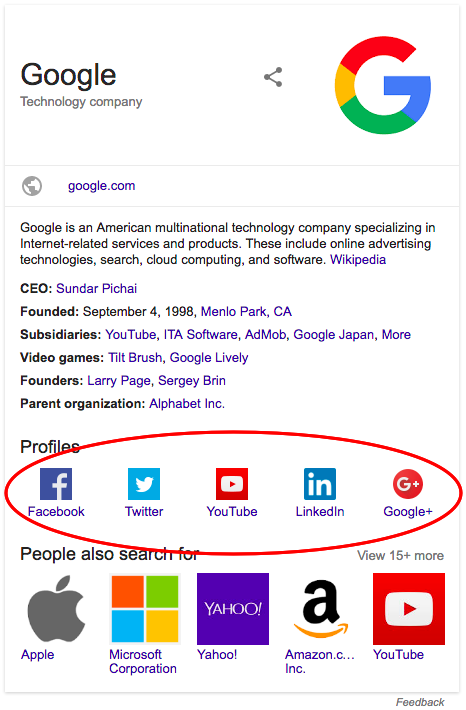 Use this markup to specify the right logo of your organization or company in the Google Knowledge Graph, the logo image helps to recognize as the organization’s logo. 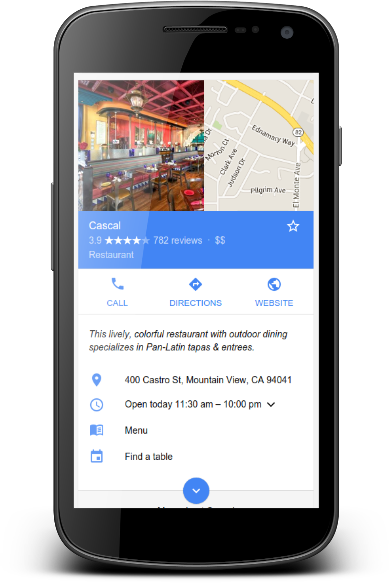 Displays the local business details about a company that matches the query entered on Google search, it can be a business type, website, mobile, Images, maps, and timings etc. 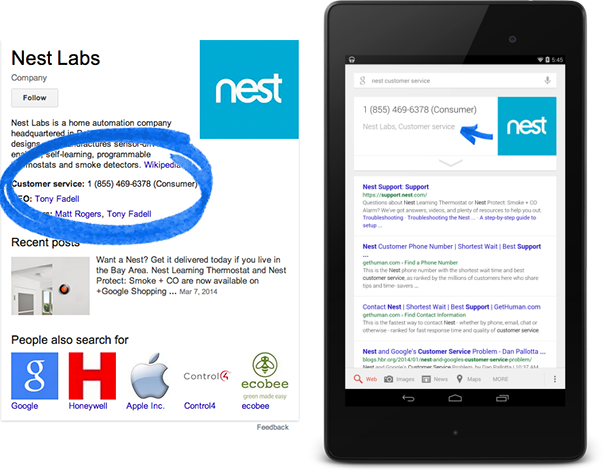 Sitelinks search box is a great snippet or rather a quick way for users to search your website or app immediately on the search results page. Use this markup code on your website so that Google displays your social media profiles information on the Knowledge Graph which is a great way for the brand building. 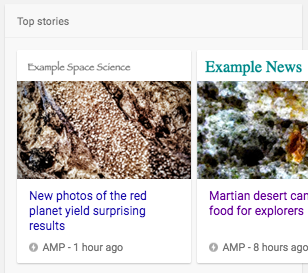 Displays the latest news, blogs, headline text, top stories and rich result features which can enhance your appearance in Google search results. Book search gallery is a direct entry point for book lovers, Google search enables users to purchase books they find for their queries instead of visiting the website a user can directly get a preview of the book from Google Books library. Displays the latest events, concerts happening near your area or city so that users can discover events through Google search results. Job Listings are enriched search results for job seekers with job details, company profile, review, ratings and lot more for a user to know about his/her job profile. Provides detailed information about the product which includes price, ratings, reviews, and availability of the stock which attracts potential buyers while searching for items to buy on Google search. Provides detailed information about the recipe content which includes cooking, ratings, preparation, nutrition information, how to prepare, advice and more. Displays review information based on critics got for a particular movie, book, restaurant, store or a local business this helps the user to review the information before taking a step further. 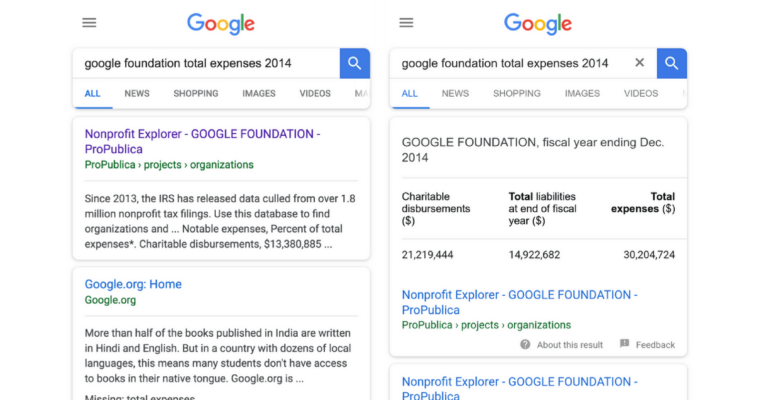 Google has also rolled out new markup for displaying data tables in search results and it is up to the website owners on how to describe which information is useful so that data is easier to discover for searchers. According to Google, following are the examples of what qualifies a dataset. Video search gallery is a direct entry point for users on Google search to click on the play button for watching your favorite videos, Video markup can be a carousel as well. Google has recently confirmed the release of the new search result snippets which are in the form of FAQs (Frequently asked questions), Q&A (Question & Answers), and How-to. According to Google, the new schema markup can be used to potentially show your content in Google search in a brand new way as ever before. We’re always looking for new ways to provide the most relevant, useful results for our users. We’ve recently introduced new ways to help users understand whether responses on a given Q&A or forum site could have the best answer for their question. By bringing a preview of these answers to Search, we’re helping our users more quickly identify which source is most likely to have the information they’re looking for. We’re currently working with partners to experiment with ways to surface similar previews for FAQ and How-to content. With this new snippet feature in place, users can find the best and suitable answers for their questions right away with one click. This also gives more insights into what searches can expect and which source or link is most likely to have the exact information they are looking for. 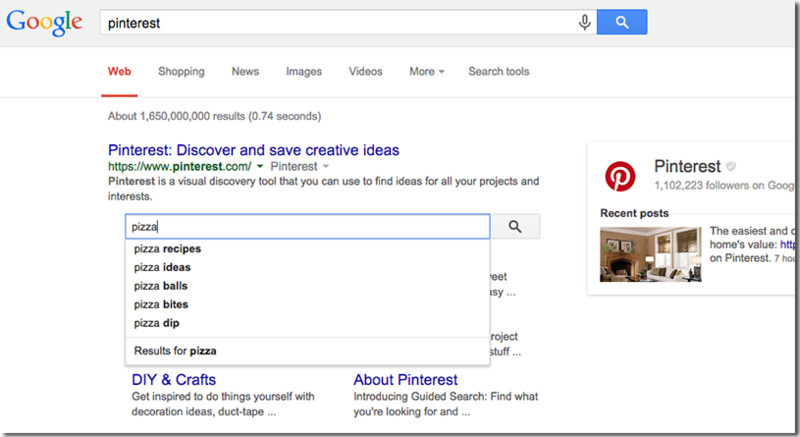 Having featured snippets for key pages on your website helps your business. It depends on how your potential customers might ask questions related to your market place and how you identify those queries in order to give them the direct answer. Getting featured in search is nothing but giving value to your business customers with some relevant content, there is no point in getting featured when your business has no relevance. Are you looking for an affordable digital marketing agency with a result-oriented plan? Please contact us for a free Digital Foot Print Analysis for your website and Consultation from our industry experts. Posted in Digital Marketing, Inbound Marketing, Search Engine Optimization•Tagged digital marketing, google featured snippets, inbound marketing, search engine optimization, search snippets, seo•Leave a Comment on What’s next on Google’s Search Featured Snippets Gallery?